Chris McGahan was a respected department head in a college that she loved. She’d built a career as one of the nation’s top eye researchers. To the casual observer, she had it made. Why give up on all that? McGahan now leads an organization with 3,700 students; 610 faculty, staff and postdoctoral researchers; and $47 million in annual research expenditures. She’s first woman to hold the position. McGahan is an NC State lifer, having come to the university’s College of Veterinary Medicine in 1983. From the moment she arrived on campus, she was hooked. “I loved the people here,” she said. McGahan grew up in Queens, New York. Science and engineering were a big part of her childhood, as her father was an engineer who helped build the Throgs Neck Bridge and the over-water runway at LaGuardia Airport. As a student, she worked all kinds of jobs. The summer between high school and college, she worked the third shift in the mailroom at JFK Airport, sorting the incoming international mail. Later, as a biology student at the College of New Rochelle outside New York City, she worked behind the cafeteria steam table to support her education. Along the way, she became fascinated with the physiology of the human eye. While pursuing her Ph.D. in pharmacology at the Mt. Sinai School of Medicine, her work caught the attention of Laszlo Bito, whose development of the widely used glaucoma medicine Xalatan later made him a legend in ocular research circles. She went to work for him as a postdoctoral fellow at Columbia University College of Physicians and Surgeons’ Harkness Eye Institute. With Bito’s help, she landed a National Institutes of Health Research Project Grant, known as an R01, that is a career-defining achievement for any researcher. She was to study trace element dynamics in the vertebrate eye. She couldn’t have known that the grant would be renewed and funded continuously for the next 33 years. In 1983, McGahan and her husband, Lloyd Fleisher, were both offered faculty positions at NC State’s new College of Veterinary Medicine. 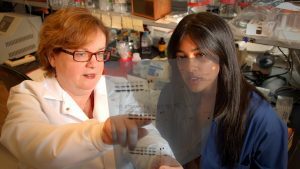 Once in Raleigh, McGahan ascended through the academic ranks to eventually became head of the Department of Molecular Biomedical Sciences, a position she held for 14 years until her deanship began in November. As a researcher, Dean Chris McGahan (left) studies the biochemistry of the ocular lens and retina. As a researcher, McGahan studies the biochemistry of the ocular lens and retina. This involves investigations into the regulation of iron metabolism in the eye, mechanisms underlying post-surgical regrowth of lens tissue, retinal physiology and pathology, and studies of retinal cell biology related to retinal degenerations. The work has earned her international acclaim; she’s a longtime executive officer of the International Society for Eye Research and will take over as the organization’s president in 2019. As an administrator, McGahan has been known for her dedication to faculty excellence, developing intensive mentoring and grant-writing programs, and creating a supportive environment that equips all faculty, staff and students for success. She’s proud to point out that every faculty member she has hired has been promoted, reappointed or received tenure. She wants to bring those values to the College of Sciences by developing mentoring programs for faculty and students. She’s quick to note that good mentoring means good listening, an activity she wants to do a lot of in the college. McGahan’s familiarity with campus is helping her dive right in. She’s been an NC State scientist for nearly 35 years, and she already knows many College of Sciences faculty. She leads the Career Development Core in NC State’s Center for Human Health and the Environment, which counts several College of Sciences researchers among its membership. Her plans for the college are still forming. In the next several months, she’ll continue to meet with as many people as possible — including attending departmental faculty meetings and student group gatherings — and lead efforts to develop a college-wide strategic plan. She wants to provide stability to a new college that has seen lots of change since its inception in 2013. And she’ll focus on ways to build new programs and support existing ones — work that aims to bring the College of Sciences to the forefront of scientific discovery.